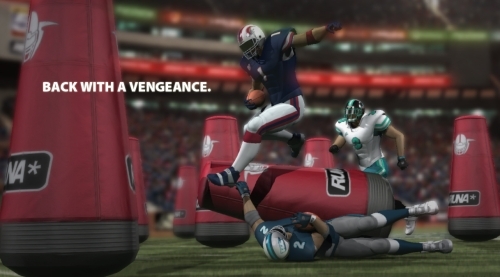 505 Games has been hyping their new iteration of Backbreaker: Vengeance, a former iOS game revamped for Xbox Live Arcade. This new iteration adds a few new features and of course upgraded graphics, but it doesn’t stop there. When it hits the Marketplace it will also come with a hard hitting price tag of 1200 MSP. That’s a pretty hefty penny for what’s basically a one trick pony. Sure, they have added some twists and turns to the game but it’s still just a football drill mode being sold as a stand alone game. It’s especially high when you consider the iOS version, roughly the same game, retails for a whopping 1 USD. We’ll just have to wait till next week when it launches to find out if it’s worth the money or if this is just another missed tackle.